Amelia Wisthoff Grayer 1861-1955. My Great Grandma Grayer. There she was in 1871, a child of only 10 years old, and on her way to America. Amelia Wisthoff was leaving Prussia while her family was staying briefly behind. A wealthy family would take Amelia with them so she could serve as a play-mate companion to their daughter. From my understanding, this family was kind and generous to Amelia and allowed her to be tutored with their own daughter. I have been unable to locate any ship records with her name nor do I know the name of the family that provided her passage. I took a few hand written notes when I was young and talking with my mother about our family history. I was told that Amelia had come to America on a steam vessel. In fact, the only verification that I have for this whole story is from my mother’s recounting and the fact that Amelia’s arrival in America did occur before the rest of her family. It was not until 1906, that America required daughters and wives to appeal for citizenship. They previously only carried the status of their father or husband. Of course, Amelia did arrive many years prior to 1906 making it more difficult to research her arrival. There is no packet of information about citizenship, because it was never required and would not have been possible for a woman to complete. The only way to figure out or try to verify Amelia’s date of immigration is from the US census records. In census records of 1880 and 1900, Amelia lists her place of birth as Prussia. By the time of the 1910 census she lists her place of birth as Germany rather than Prussia. This is easy to historically explain as the borders were changing often. My mother told me that she came from a place near Berlin. The subject of this story, Amelia Wisthoff Grayer, was my maternal great grandmother. I was one year old at the time of her death in 1955. I am fortunate to have photographs of her and my great grandfather, August Grayer. I am also fortunate to have photographs of myself with my great grandmother. For the rest of this story, I will refer to Amelia as “Grandma Grayer” for that is what our family called this strong and lovely woman who lived a long full life. My mother would be close to her grandmother, would spend much of her childhood having her girlhood home opened to have her grandmother live in and even sharing a bedroom with Grandma Grayer. In her adult life, Grandma Grayer spent much of her time doing amazing crocheting and tatting. My sister, Mary Ann, carries on the tradition of advanced crochet skills and has made heirloom blankets, snow flake art pieces, and lovely hats – all with a great sense of color and style. It is nice to know this tradition carries on in our family- a special type of legacy. But, now, back to 1871. Grandma Grayer had started the voyage to the U.S.A. as a 10 year old. The destination would eventually lead her to Ann Arbor, MI. Ann Arbor had a large German settlement. 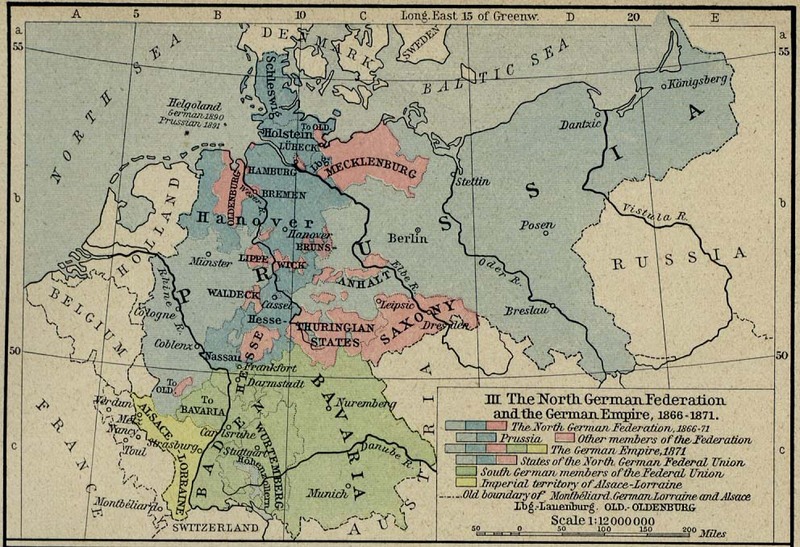 It seems that about 75% of the Germans who came to Washtenaw County were from Württemberg. My mother had told me that she had come from a place near to Berlin. I do not have any documents that support her German city of origin. Grandma Grayer’s parents would follow Amelia within a year, arriving stateside in 1872. My family called her parents (my great great grandparents) “Grandfather Wisthoff” and “Little Grandma”. They were William Wisthoff and Ernestine (or Ernestina) Nevroth. We also have family photographs of these great great grandparents. Grandmother Grayer was one of 4 girls and had 3 younger sisters. The 2nd in the birth order of the girls and Grandma Grayer’s sister was Hulda Grayer. At the age of 19, Hulda married Adolph Kern in Washtenaw County. In the 1910 census, Hulda and Adolph live at 717 N. Main Street. Adolph worked in a flouring mill as a miller. Hulda stayed at home and worked as a seamstress. Huldah’s 1927 death certificate gives her address as 926 Catherine Street, Ann Arbor. The 3rd sister in the birth order was Emma Grayer who arrived in America at the age of 5. Emma would marry Fred William Ehrenberg who was a blacksmith and owned his own shop. They lived at 170 Pontiac Road, Salem Township, MI. Emma died in 1936 when my mother was only 11 years old. I do have a copy of her death certificate that states she died from apoplexy with a contributing factor of high blood pressure. The youngest of the girls was A. Ernestina Grayer. She would marry William Carl Scherdt. William was a woodworker who worked at Ann Arbor Machine Company. In a government form he completed he states that he is unable to serve in the service because he lost his right leg to his knee. He also states that they reside at 302 N. Fifth Avenue, Ann Arbor, MI. Now, let’s travel 5 years forward from Grandma Grayer’s arrival in the states. The next part of the story seems VERY strange from our 2018 perspective, but was more common in 1877. You see, Grandma Grayer was only 15 years old on February 1st, 1877, when she married August Grayer who was 28 years old. They had their first son Herman Grayer (my great uncle) on October 29, 1877. At the time of Herman’s birth, Grandma Grayer was only 16 years old! The wedding records for Grandma Grayer and August Grayer list his name as August Frederick Kreuger. My mother told me a story about the Kreuger/ Grayer name story, but I was very young and do not recall all of the details. I do remember that there was some sort of divide and conflict in the Kreuger family and some of the folks including my great grandfather changed their last name to Grayer. I am so lucky that I took notes of this discussion. It is funny for me to look at my hand-writing. I recognize it as my junior high/high school penmanship. I do not know if Grandma Grayer’s marriage was arranged. August was known to be a hard working farmer. He spent most of his time farming in Scio Township, MI but retired 8 years prior to his death and then lived at 404 N. Ashley Street, Ann Arbor, MI. This is more exact information on his place of birth: Hammer-Sandkrug, Posen Province, Prussia. He arrived in America when he was approximately 15 years old. In 1879, Grandma Grayer was 17 years old. She had a new sister born the same year that she gave birth to her second child, a girl. Grandma Grayer’s second child was Whilimina L. “Minnie” Grayer was born on 23 April 1879. This was our “Aunt Minnie.” She married Frederick Gross. He was a merchant and first operated a store at 115 E. Liberty, Ann Arbor, MI and then at 309 S. Main Street, Ann Arbor, MI. In the 1880 census, records indicate that Grandma Grayer and her husband August Grayer are living with their son Herman, and their daughter “Louise” (I believe that Louise is Great Aunt Minnie’s second name.) August’s 23 year old brother Fred Grayer is also living with them at the time of the census. (note: they also lived just 2 houses away from Grandma Grayer’s parents- The Wisthoff’s.) Some of Grandma Grayer’s sisters are younger than her own son Herman Grayer! The fashion of re-naming seems to run strongly in our family. Grandma Grayer herself was an Amelia (originally Emilie) and then named her daughter, my grandmother, Amelia (this was Grandma Pet.) I named my daughter Amy, a derivative of the name Amelia, and a name that is so beautiful to me and means, dearly loved, or beloved. On 14 September 1885, Grandma Grayer gave birth to my “Grandmother Pet” who was Amelia Grayer. This was a truly beloved Grandmother. When I became a grandmother myself in 2012, I asked to be also called “Grandma Pet” as a tribute to this woman who was for me a form of truest love. I will write a blog on my Grandmother soon. She married Grover Cleveland Ream, a carpenter, in Ann Arbor. In 1888, Grandma Grayer had a daughter Adelaide Amanda Grayer. She would marry Frederick Miller. In 1897, Grandma Grayer’s father, William Wisthoff, died of consumption. The youngest of Grandma Grayer’s children was “Aunt Babe.” This was Helen Mae Grayer born on May 20, 1890. She married Walter Mayer. In the census of 1900, we see that Grandma Grayer confirms her entry date from Prussia as 1871. Her husband, August Grayer, who was by then a naturalized citizen, had immigrated in here in 1864. Because he is a citizen she would automatically have had that status also. August came from Hammer-Sandkrug, Posen Province, Prussia. In 1908, there is a posting in the newspaper for the sale of August and Grandma Grayer’s 63 acre farm, 5 miles north of Ann Arbor. By the census year 1910 under the name Wisthoff, we see that Grandma Grayer’s mother “Little Grandma” Ernestine Nevroth Wisthoff had stated that she immigrated in 1872 which is a year after Grandma Grayer arrived here in the states. This census also shows that Ernestine (Grandma Grayer’s mother) is living in Ann Arbor at 602 Goth Street (probably Gott Street that was misspelled). “Little Grandma” is living there with Grandma Grayer’s sister, A. Ernestine Grayer Scherdt and her son-in-law, William Carl Scherdt. “Little Grandma” lists her occupation as nurse. Her son-in-law, William’s occupation is ladder maker. I also remember that my Grandma Grayer was a nurse. I think at this time in history, it might have been a learned skill rather than something obtained by years of education. Her mother was a nurse, and she might well have studied under her mother. Also in the 1910 census, the birth location for Grandma Grayer and August Grayer has changed from Prussia to Germany. Grandma Grayer is now 49 years old and August is 61 years old. In May of 1912, the paper announces that August Grayer and Grandma Grayer’s new home is almost ready to be moved in to. This will be the house at 404 N. Ashley, Ann Arbor, MI. 1917 must have been a very difficult year for Grandma Grayer. In July of that year, her mother (“Little Grandma”) passed away and then one month later in August, her husband August Grayer passed away too. By now Grandma Grayer is already 55 years of age. Grandma Grayer re-married in 1920 and the marriage was brief, lasting only a few years. I believe it ended in divorce. She married Edward Osiander. He was employed at the time as a foreman at the Hoover Ball Plant. He had a previous divorce from a wife also named Amelia. My mother said this marriage was not talked about much in her presence. In 1930, Grandma Grayer is living as the head of household at 404 N. Ashley and has 2 boarders. By this time, my mother, Gretchen Ream, who was a girl of 5 in 1930 was living at 520 N. Main Street, only a short walk to see her grandmother! My mother would lose her father in 1931. I do not know at what point Grandma Grayer came to live with Grandma Pet, my mother Gretchen Hess and my uncle Robert Ream on North Main Street, but my mother often recounted living with her Grandmother from childhood thru young adulthood. My guess is that she moved to North Main after Grover’s death, although it does look like she spent some time also at Uncle Herman’s house- just a block or so away. The home on 520 N. Main was a house for lodgers. This was the livelihood of Grandma Pet (Amelia Grayer Ream.) The house was only a short walk to the downtown district and the University of Michigan. Although Grandma Grayer lost part of her vision as she aged, I believe that at her time of death at age 93, she was living a full life. Photos of her at this age still show her with a crochet project in her hands. 1927, Grayer, Herman W. (Luella D.) 502 N. Main, Ann Arbor, MI – power plant at U. of M.
1938 Grayer, Herman (Luella D.) 502 N. Main, Ann Arbor, MI – eng., U of M building and grounds dept. 1911 Grayer, Helen, seamstress for Mack & Co., bds. at 400 Ashley North, Ann Arbor. 1900 (from the census records) There is a notation that Ernest Grayer (age 18) and Amelia Grayer (Grandma Pet, age 14) are living with Foster and Martha Brown in Ann Arbor Township. Ernest is a farmhand and Amelia (Grandma Pet) is a domestic. This entry was posted in Early Ann Arbor history, Family History, Grayer Family, Ream Family, Uncategorized and tagged A. Ernestina Grayer, Adolph Kern, Amelia Grayer, Amelia Ream, Amelia Wisthoff, Amelia Wisthoff Grayer, Ann Arbor history, August Grayer, Early Ann Arbor, Emma Grayer, Ernest Grayer, Ernestine Nevroth Wisthoff, Families of Ann Arbor, Fred William Ehrenberg, Frederick Gross, German immigrants in Ann Arbor, Grayer or Krueger, Gretchen Ream, Gretchen Ream Hess, Grover Ream, Hammer-Sandkrug, Helen Grayer, Helen Mayer, Herman Grayer, Hulda Grayer, Huldah Amelia Grayer, Minnie Grayer, Posen Province, Prussia, Viola Nienkirk, Wilhimina Grayer, William Carl Scherdt, William Wisthoff on January 19, 2018 by wonderfulstoryphotos.